December art study: Masks. The ladies and gents had a fantastic time. We looked at pictures of masks from around the world, talked and read about the significance of masks in different cultures and reasons people create and wear masks, played with the masks in the dress-up box. Then we made our own masks. The brave and patient lovely ladies wanted to create plaster masks using their own faces. Lovely lady, 11, partway through the process. Interesting aside, something loving husband and I both noticed: In their masks each child (we invited friends over to play with the messy stuff) looked desperately unhappy. They weren't. But something about the absence of facial movement and the covered brows made them look as though they were apathetic, depressed, and a little ticked off all at the same time. People with autism tend to interpret facial expressions with a different part of their brains, so I was thinking that I should show the pictures to this lovely lady and see what she thinks-- I suspect that when viewing her picture she'll tell me that her expression is showing how she actually felt at the time (fine, having fun) rather than how she looks (bored, kind of upset). This lovely lady also has some sensory issues, but she was completely unphased by the whole Vaseline, hardening plaster experience. She practiced piano in the basement the entire time her mask was setting. Her lovely sister breezed through as well, and (fortunate girl) her mask didn't end up quite as lopsided. So we blew up a balloon, covered it with plastic wrap, put a plastic half-mask like this on the balloon, and covered the whole thing with plaster strips. The plastic mask helped us create more realistic eye and nose holes. His mask looks pretty cool, all round and odd, as though he's some kind of alien moon man. Younger brother just started with a plastic half-mask, covered it with plaster strips (bottom right in the picture below) and tootled off to play. Assemble your supplies and prepare the work area. 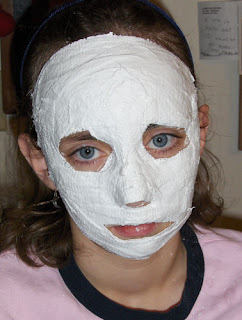 Liberally apply Vaseline to the face, hairline, and eyebrows of the student, or cover your balloon with plastic wrap. Follow the directions on the inside of the Rigid Wrap. After making the masks on small kid faces, I'd recommend cutting half the strips smaller than those recommended in the Rigid Wrap directions, and keep the scissors handy to cut pieces to fit. In a nutshell, you wet the strips and apply them to the face (there are specific directions for creating a good face masks inside the package), smoothing the strips as you go. It took about 15 minutes per child for the actual application. Once application is complete, let the wrap dry for 20-30 minutes. Gentle pull the mask off the face. Make sure you allow plenty of time for the project: Applying the plaster properly takes time. 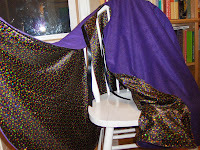 The Rigid Wrap takes 20+ minutes to dry. 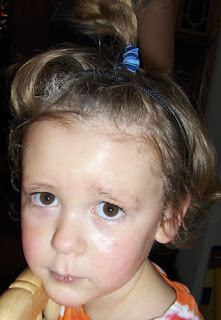 And the kids' faces will be pretty slicked up with Vaseline, so allow cleanup time for faces and hands. My kids just waited until evening deal with their hair. The Vaseline was mostly gone after 2-3 washings. 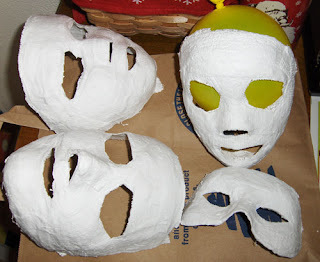 The masks are well worth the good bit of preparation and mess and concentration. We had fun and it really made the masks personal and meaningful. If you knew the three children whose masks are pictured above (one of mine, two from our friends' family) you could pick out immediately which mask belongs to which child. Taking the time and effort to create masks of their own faces also motivated the ladies and gents to really make thoughtful efforts to create the finished product. We found both of these books at the library. 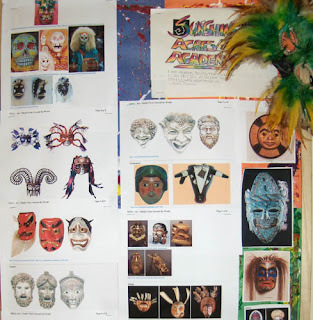 Mask lesson plans, including mask-making directions and lesson on the cultural and artistic significance of mask-making. Today I remarked of the ladies and gents, "Sheesh, those kids are so bossy this morning." Loving husband patted my shoulder gently and said, "They can't help it. It's genetic." He may have thrown the words "control freak" in there somewhere. A couple weeks ago, if you'd asked me about The Maltese Falcon I might have said something along the lines of, "Oh yeah...that sounds familiar. Isn't it a book? Maybe a movie?" Where have I been? Last week, I grabbed this book on my way to the library checkout counter, a volume with three Dashiell Hammett novels: The Maltese Falcon, The Thin Man, Red Harvest. Dashiell Hammett proved to be just the ticket for reading during a busy holiday. I devoured these books, staying up way too late reading. Good solid wisecracking-gumshoe tales all, complete with shifty characters, corrupt police, pretty dames, lots of action, and good-old-fashioned whodunnit. The plot and characters are engaging, fast-paced, and fun to read. The dialogue is fantastic. The Maltese Falcon is the story of Sam Spade's encounter with a beautiful young woman who pulls him into a complicated plot involving a priceless statue, lots of money, tangles with the police and with some bad guys, and murders to boot. The strands of this tangled web unfold perfectly as Spade tries to figure out what the heck is going on, who he can (and can't) trust, and whether or not he's going to make it through the whole mess alive. The Thin Man, also a movie (I may just send wonderful husband on a trip to the video store) features retired detective Nick Charles and his charming wife Nora. A completely screwed-up family, former aquaintances of Nick's, pull him into a murder mystery that begins with the murder of young Dorothy's father's secretary. I fell in love with Nick and Nora. Absolutely charming, Nick's cynicism is balanced by Nora's wide-eyed enthusiasm. Another quick-paced, wise-cracking, twisting-turning thriller. Red Harvest was a bit different, though still well-written and action-packed. Told in the first person, the story centers around a private eye sent to "Poisonville," a city overtaken by the criminal element. Everyone is in everyone else's back pocket. There are no good guys. Even the main character-- he does the job he's paid to do, ridding the city of the criminals, but he's definitely an ends-justify-the-means kind of a guy. A lot of bloodshed in this one. Here's the danger in reading one of these three novels in one volume deals: By the third novel I'm tired. I'm ready for a change no matter how well the books are written. But even though I've finished a novel in the volume, it just doesn't feel as though I'm really finished because I haven't read the last page of the book itself. So I plug on. I liked Red Harvest but I'll admit I skimmed through some of the gunfights near the end. (Sometimes I fast-forward through those never-ending car chase scenes in action movies too. I really just want to know what happens next.) My suspicion is that I'd not have enjoyed Red Harvest quite as much as the other two anyway, not because it's not good but because the other two are so well-done that they can't quite be matched. Loving husband is always up for those errands that I hate to run, and says sure he'll run to the video store sometime this weekend. I can't wait to see the movies! Dad sent me a guitar for Christmas. I'd picked up his guitar this summer and plinked out a tune, and suddenly I missed playing after not even thinking about it much for years. When the package arrived, I knew what was in the box. I wish I could say that I am a good guesser, but I'm not-- he phoned to tell me that's what he'd be sending. I stuck the box under the tree anyway, wouldn't tell anyone what was in it. I'm a sucker for suspense and anticipation. I love it. I played guitar...gosh, too many years ago when I count them all up. Funny, I still feel like I'm 25. Naturally, I've forgotten everything I'd learned so long ago. I'm starting over from scratch, but the feel of the guitar in my lap is still familiar. My fingers are sore, that's familiar too. Fine young gent (6) and I have made a pact that we'll both practice daily, him on piano and me on guitar. I promised him I'd learn to play "Twinkle Twinkle Little Star" so that we can play together. Modeling good practice habits will be helpful for this musical young gent. Lovely lady (11) wants to bring her guitar from her dad's house. We can be practice buddies, she says. I've been looking for ways to spend time with her that honor her new "grown-upness" and that sparks her interest. Music has always been important to my father. Not just passive listening, but actively making music. Some of my warmest memories are of family making music together, Dad on the guitar. 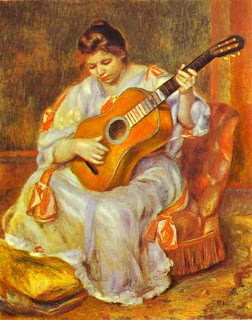 My Irie sis has taken up guitar too. Playing guitar is like having a little piece of my family in my home. And today, after knowing loving husband for quite some time, I found out that he played the guitar for many years, just plunking around for fun. Hmm, maybe I can talk him into getting his own guitar someday. Christmas has always been a special holiday in our family. 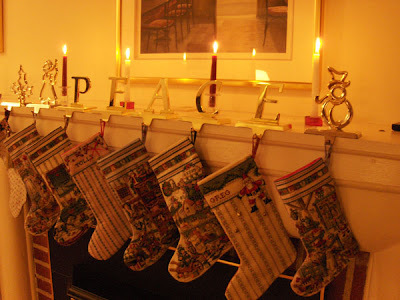 We enjoy every bit of the season: the smell of greenery, the candles on the mantle, putting out the stockings I’ve handstitched, the music, the colors and lights. 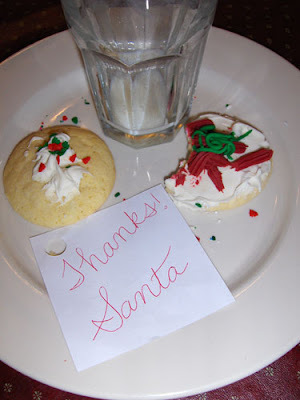 I love the Christmas morning anticipation as antsy kids wait to see what’s in the packages under the tree, watching the kids opening their stockings and the carefully chosen gifts, snuggling on the couch afterward, eating a cozy candlelight dinner. Two years ago I was hugely pregnant during the holiday season, due December 20th . “Oho, think it’ll be a Christmas baby?” people would chuckle. I’d laugh and say something equally silly like “Wouldn’t that be fun?” All of my gifts were wrapped by the middle of November. I had detailed Christmas Day instructions for my mother-in-law who was planning to stay with the kids while I was in labor. December 23rd I burst into tears and cried all over my husband because I wouldn’t be holding my baby on Christmas morning. 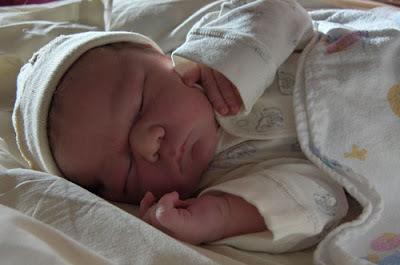 Memories after the birth are another jumble of impressions: Nursing for the first time and crying on the phone with my sister in Ireland because I missed her, the nurse triple-checking my son’s weight (10 lb., 9 oz. ), my husband bringing me chicken-and-dumplings which was the best meal I’ve ever had in my life, the other children meeting their little brother then going home for breakfast, napping with baby and waking to the sunlight streaming in the window. And the quiet. The quiet was marvelous. No cars. No voices. No sounds. It was as though the world had stopped. I was home by noon, watching the Christmas bustle while holding my sweet baby in my arms. He came home without a name, and was nameless for two days. On the third day we named him Levi, which means “united” or “joined together." As we approach his second birthday I can’t believe how these two years have sped by. That sweet infant that slept in my arms is running around and talking and playing Hot Wheels with his brothers. His birth has changed at least one of our family traditions: We’re having a birthday celebration after dinner, with balloons, and instead of baked apples and poached pears for dessert, we’re having birthday cake. Yum! There's an emotional storm moving in, with a high drama warning. Parents, batten down the hatches and be prepared for floods of tears and high whines. Glacial tones and frosty looks may follow. Winter Birds, Jamie Langston Turner. What a lovely, well-written story. It's the story of Sophia, an eighty-something year-old woman who moves in with her nephew and his wife after a lifetime of silence and loneliness, of being drab and plain, hiding much of her spirit and intellect even from herself. When I picked it up from the library I was hesitant to begin. After reading the blurbs on the back cover it sounded...heartwarming. "An insightful and moving portrayal of the transforming power of love." *sigh* I read the book anyway. Insightful, yes. Moving, quietly. Did love transform the Sophia? I don't think so. I think that's one of the points of the whole story: Sophie gets to be who she is, who she's always been, and she's shown kindness and love. And, just as important, she is valued for what she has to offer: She can sit with a child, teach a sullen teen, make a perfect peach pie for a friend, care for the people around her. It would be tempting to foist some religious symbolism upon the scene just past, for I have read the Gospel According to John in the red Bible....And how do I explain what Rachel has done? If I thought for a moment that she had simply purposed in her heart to obey a commandment, that she set her jaw to the task and humbled herself as an emblem of Christian piety, I would have kicked over the basin and drenched her with the liquid indulgence. No thank you, I would have said, I do not care to be a part of a religious reenactment....In the end I have no explanation that makes sense. It is a mystery. The reason Winter Birds works without tipping over into "heartwarming" is that Turner just tells the story without trying to foist meaning onto the story. She lets her characters, particularly Sophie and Rachel, be real, as real as fictional folk can be, at any rate. Mindy, the neighbor's struggling teenage daughter, tutored by Sophie for part of the school year, doesn't become Sohpie's best young friend, she doesn't turn her life around as a result of Sophie's involvement in her life. But a friend of Mindy's tells Sophie, "Mindy said you were smart." And Sophie glows, inwardly. Turner is gifted at writing silence-- Rachel's silent slow movement around the house and her wordless kindness, Patrick's uncharacteristically unspoken love and care for his wife, Sophie's wordless acceptance of the gifts she's given. Turner trusts the reader to read between the lines, to read the silences, to understand that even in a novel sometimes actions speak far more potently than words. Corrigan goes on to write of the solitude, the inner journey, the quotidian that mark the female variant of these extreme-adventure stories. A favorite bit so far is when Corrigan envisions Jane Austen and Charlotte Bronte as army privates in WWII movies: Austen as the wise-cracking kid from Brooklyn, Bronte as the kid overcome by the horror of war. And I'm only about 1/3 through the book. Cristy just decorated her tree. Which meant that the evening before she called to say, "What should we do for our Tuesday Ten this week?" she was unwrapping the ornaments for her tree, so that's what came to mind. Decorating the tree is one of my favorite holiday traditions. Each child has their own ornament box, to which we add one ornament each year. This year the gents got German glass cars and the girls got Flower Fairies. It's almost as special unwrapping old favorites the weekend after Thanksgiving as it is unwrapping new prizes on Christmas morning. "Mom, look, it's my puppy angel!" "When did I make this? I forget." "Oooo! I love this one!" The younger lovely lady's very first ornament, a Momma bear and her cub. It reminds me that I was so in love with being a mommy. My sister gave me this ornament. Years ago, I moved in to a new apartment with a friend right before Christmas. We hadn't even had time to shop for groceries or unpack our boxes, but we had a last-minute Charlie Brown Christmas tree. This tiny angel went on the top of the tree. On Christmas morning, my friend and I ate m&m's for breakfast (no groceries, remember), exchanged small gifts, and commiserated about the relationships we'd left behind. The eldest fine young gent's first ornament is really a little elf doll that sits in the branches of the tree. The gent was pretty tiny, only a month old on his first Christmas. The ceramic mice I painted when I was a first grader. Mrs. Jorgenson, my first grade teacher (I wrote about her here) wasn't a completely bad egg. Her sister owned a ceramics studio, so Mrs. J undertook the considerable hassle necessary to arrange for two separate field trips for antsy first-graders to visit the studio and paint their own ornaments. I still remember painstakingly painting two little mice in Santa hats. The angels. 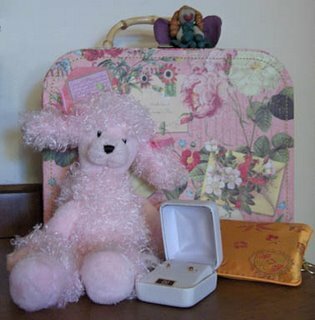 Lovely lady, 13, has the Angel of Love. Her sister's ornament is the Angel of Independence. Fitting for each, my loving heart girlie and my free spirit. And fine young gent, 6, has the only ornament I could find with a boy on it. I forget what his is supposed to represent. Playfulness, maybe? The younger gents weren't around the year of the angel ornaments. 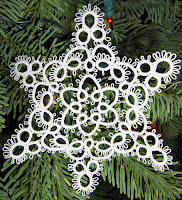 Beeswax ornaments. We try to make gifts for friends and teachers each year. 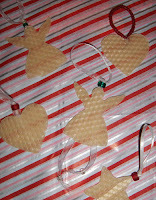 This year we made beeswax ornaments. They are simple, lovely, and they smell delicious, just like honey. Cross-stitched ornaments. Each child has an ornament that matches his or her stocking. Oregon ornaments. One for each child, they're all beautiful. 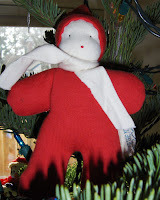 Crocheted Santa. Grandma Ruby crocheted these ornaments for my family when I was still in high school. They've since passed on to our own trees. Snowflakes. So delicate and pretty. This was made by a friend of my mom's, a knitter. I have one or two made my my sister, too. They're so lovely against the dark green of the tree. Find flat sheets of beeswax. This was the hardest part of the craft. Craft stores, places that sell honey, the internet, candle-making kits all sell flat sheets of beeswax. I've heard that places that sell Waldorf supplies also stock beeswax. Lay one sheet of beeswax on the cutting board. Choose a cookie cutter, and cut two of the desired shape. Tie a knot near the top of the ribbon, leaving a loop for a hanger. Thread a bead onto the ribbon and push it up to rest against the knot. Place the ends of the ribbon on one of your beeswax shapes. Place the matching shape on top, matching the edges and press gently. The two shapes will stick together, with the ribbon inside. If you've left your ribbon long enough that you've got decorative ends dangling from the bottom of the ornament, thread a pretty bead on each end and tie a knot to prevent the bead slipping off. Voila! you're done! You've got a lovely sweet-smelling ornament for your tree or someone else's. Remember our big living room picture window? The huge, fifty-and-then-some year-old single pane glass window? (I know, some of you don't even know we've got a big picture window. Had. Just pretend you remember it fondly-- you're a perceptive bunch and you can already tell this story does not have a happy ending.) Lovely lady, 11, was playing with the youngest gent, slipped and fell against the couch, which slammed into the window. We now have a styrofoam non-window covered with lovely plastic sheeting. I'm just grateful that it was the couch and not a headfirst child. Fine young gent, 6, was sick today. High fever. He told me that he felt "spongy." I knew exactly what he meant. The gents are going to be so excited about their capes. 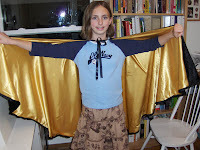 Capes made with less than half the fabric were going for $25 and up at the Holiday Market. At $1.99 a yard, it cost me $6 plus thread and ribbon and a couple hours to make the capes (and mine are hemmed and edgestitched and have finished necklines instead of bias tape). Too bad the idea of sewing the same thing over and over and over again makes me want to jump out a window. I decided to count the Hot Wheels, just for curiousity. Without counting the cars hiding in the crack of the couch, under the beds, at the bottom of the toy box, in the van, in the laundry hamper, and all of the other places they tend to hide, the boys had 90 little cars. Nope. Not a typo. NINETY. Sheesh! 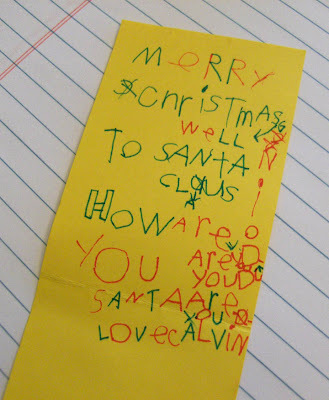 Guess what they asked Santa to bring? I just hope that they don't become those balding 40ish men waiting outside Target on Tuesday mornings, hoping to be the very first to buy the newest Hot Wheels for their collection. The gents were in the Sunday school Christmas program today. 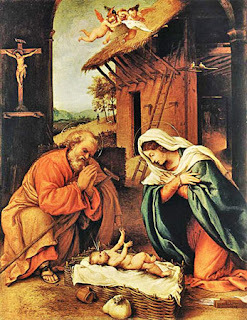 The two youngest gents wouldn't go up in front of the church without me, and the 2-3 year-olds don't really sing anyway, so the preschool program consisted of me and two Sunday school teachers singing "Happy, Happy Birthday, Jesus!" while the little ones stared at the audience. The middle gent would only stand with his back to the audience. The oldest gent is in a different class. He was all dressed up for the program but he didn't take off his jacket because he was cold. He drew a picture of the Christmas star and his class sang some songs. Turns out he was cold because he had a nice high fever setting in. Yep. We're great parents: Let's infect half the kids in church right before Christmas! I'm a musical gal, really. I often say cheerful things like "I enjoy all kinds of music," and mean it. I love Christmas music. I love concerts. The lovely ladies had a Christmas concert downtown this evening at The Shedd, along with the Oregon Tuba Association and the wonderful Cascade Chorus. When I read that it was a tuba concert, I was actually kind of excited to hear something new and different. "Tubas. How fun!" I said. Don't get me wrong, the tuba has its place. Like in a marching band. But a Christmas concert ensemble made up entirely of tubas and the like (I understand that there are actually different tuba-ish instruments, but my attention was already wandering by the time the guy got around to explaining them), just not my cup o' tea. The first song was entertaining, but one round of Deck the Halls with some oom-pah-pahs between verses, for laughs, was plenty for me, really. I found myself wondering things like, "Man, that guy's feet are really really big. I wonder what shoe size he wears?" and "I really like that lady's hat. I wonder if she knit it herself?" (which is what having knitters in the family does to me) and "When is this going to be over?" Then the girls got up to sing. That was lovely. More tuba. The Cascade Chorus sang, which was wonderful. I got chills when they sang "O Holy Night." I noticed the directors of the two girlchoirs come and tap each of my daughters on the shoulder and take them out to the lobby. The girls came back, smiling. More tuba. Then a sing-along with the tubas. The tuba is a loud instrument, very nice for sing-along accompaniment. And it was over. Turns out that the girls had been interviewed on television. The choir directors were asked to identify one girl in their choir who'd grown or made a lot of progress this year. They had no idea that the girls were sisters until the two got out to the lobby. We watched the interview on television a few minutes ago, and it was very sweet. The younger of the lovely ladies said, "I just think a happy thought and tell myself that they aren't really here to look at me, they just want to hear my voice." Which is almost exactly what I told her friend yesterday when the girl showed up to yesterday's concert wearing her Oregon Children's Choir polo instead of her dress uniform. It's so nice to know that sometimes it sinks in. The elder of the lovely ladies said that she loved singing and felt more confident with her voice so that she goes around singing all day. Lovely step-lady's mom came to the concert, so they left together. Younger lovely lady and I went to the bookstore for a treat and some browsing, because (we both agreed) that nothing rounds out a nice evening like a trip to the bookstore. While there, we ran into lovely lady's good friend-- the friend's dad also feels that a trip to the bookstore rounds out an evening nicely, so we run into them from time to time. The girls visited for a bit, then off home to watch the news. It was a lovely evening. I learned a lot, chiefly that while tubas are very nice, they are not for me, and that it's worth sitting through some well-played tuba-ing to hear my girlies sing. ...when we got to "Son of God, Love's Pure light" I happened to look at Imogene and I almost dropped my hymn book on a baby angel. Everyone had been waiting all this time for the Herdmans to do something unexpected. And sure enough, that was what happened. Imogene Herdman was crying. In the candlelight her face was all shiny with tears and she didn't even bother to wipe them away. She just sat there-- awful old Imogene-- in her crookedy veil, crying and crying and crying. Well. It was the best Christmas pageant we ever had. My children see this as a story that reminds us that Jesus was a real person, a little baby who was born in a barn and needed his mom. I remind them that there's a message through the Herdman children about the goodness and humanity in all of us. I know. I'm an awful sap. Maybe I'll be able to read it without crying next year. Of course, that's what I said last year. Dilemma: What Would You Do? It's pouring rain. I rush out the door to get a lovely lady to her tutor's house on time. I notice the library books are in the car and remember that there are two that need to be returned today (or else-- And why do I always get the crabby librarian on the day I've got overdue books?) and two requests waiting for me. I'm out and about, so I may as well kill two birds with one stone, right? I pull up in front of the library. A. Go home, take the library books back on another day and pay the library a fine, probably less than a dollar. Unless we get really really busy and I can't get them back until the next library day, in which case I'm certain to get the crabby librarian when I check out. B. Drive all the way home to get shoes. Come back to the library. C. Walk through the parking lot in the pouring rain in my fuzzy flowery girly slippers. I chose option C. Partly because I am practical, partly because my slippers are wrecked anyway and walking through a few puddles certainly wasn't going to do any more harm, and partly because I got a mystery package today. I don't know what's in there or who sent it, but it's from a shoe place and though there's no label, it's got the word "pink" on the front. Now I just have to decide...does the package go under the tree? Or do I open it now? Last night eleven-year-old lovely lady's choir sang at a nursing home (or retirement community or assisted living facility or whatever it was called). The girls were relaxed and confident. They were only a few feet from their audience, singing songs that they love. And something magical happened. They forgot they were performing and they just sang together. Beautifully. Sweetly. Simply. "Peace, peace, peace on earth...."
The elderly woman next to me stopped talking. The staff stopped to listen. I had tears in my eyes. A woman sitting in the front row quavered "Beautiful. Beautiful," when the girls finished their song. Why? Their voices were sweet and pretty, but not perfect, not professional, not angelic. And those sweet girls are no angels. They're just regular kids. Sweet and good and kind and snotty and thoughtless and rotten. Just like the rest of us. But in that moment they sang of peace on earth and meant it. When these children sing "Let us all sing together of peace on earth," they still believe that peace is possible. They imagine still nights, and dream of people around the world holding hands and greeting one another with love. A choir made up of grownups with the finest of voices could never sing that song the way those girls did. Whatever challenges the girls may face in their individual lives it is likely that most of them didn't wake up in the morning to read a story in the paper about three little boys...little boys...blown up because their father works for a government with which the bombers disagree. (Why do I read the paper? Stories like this bring me to tears. "What's the matter, Mom?" asks the six-year-old gent. Do I tell? Or not?) Stories of poverty and famine and war from all across the world. Knowledge of the truly horrible things that human beings can do to one another. Once we grow up and start to see the world, I don't think we can truly sing the words "Peace on earth" without regret and grief mingled with our hopes for peace on earth, goodwill to all. Did I say those girls aren't angels? Maybe they are, just a bit. Their choir director asked them to please visit with the audience for just a little while-- to say hello, and introduce themselves, and maybe tell a little about their lives. Those sweet girls, they were truly lovely ladies. Almost every single girl made a real effort to reach out and talk to the men and women in the audience. My lovely lady said that it was her favorite part of the whole visit. Even better than the cookies and card-making party afterward? Yes, she said. She was thrilled that she'd met a woman who is 93 years old. She wants to go back to visit sometime. 1. Bake and decorate a cake. Fine young car fanatic (remember this post? ), now 6, decided upon a "car party." 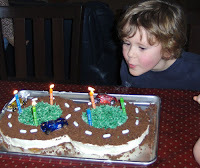 I suggested the race car cake, he suggested the activities: Watch the movie Cars, eat cake, and play with his Hot Wheels. 2. Plaster masks. Our latest art study. We'll be decorating these all week. 3. Yuletide carols being sung by a choir. 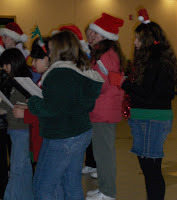 Following lovely lady's Friday evening choir practice, the choir went caroling at the mall. 4. Saturday choir practice. No picture because I was too busy shuttling girls to overlapping practices in two different places. 6. Errands. There were probably enough errands to write a "Ten Errands I Ran This Weekend" list, but I'll lump them all into one. I had to pick up pre-rehearsal snacks for 30 hungry girls, tights for the girls' choir uniforms, get an ornament for a choir party ornament exchange, find chocolate cookies and white candies for the cake, run to the grocery store between choir rehearsals for black nylons for the recital dress, art supply store for watercolor paper for a lovely lady so that she can paint a Christmas gift. I know I forgot a couple, but that's enough, isn't it? 7. Birthday party. 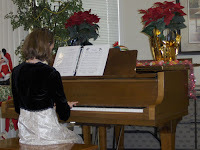 Along with the actual birthday party, I had to rush home immediately after the recital to clean the house. 8. Concert. Oregon Children's Choir, Junior Girlchoir. The girls sang beautifully, the marimba players were fun and energetic, the other choirs were wonderful, and the finale included all of the choirs and some local singers. Lots and lots of fun. 8 1/2. Run around like a chicken with its head cut off, looking for my car keys. It was time to leave for thirteen-year-old lovely lady's evening concert. I couldn't find my keys anywhere. I ended up taking my mother-in-law's car. Another mom cheerfully told me, "I'll bet as soon as you get home they'll be right there in plain sight." I replied, "I'll bet that when loving husband-with-his-cell-phone-off gets here, they'll be in his pocket." Right on cue, he walked up. Guess where he found my car keys? 9. 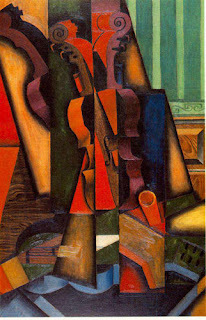 Concert. Oregon Children's Choir, Girlchoir. Wow. Lovely lady's choir worked through the problems they'd been having yesterday and gave an amazing performance. The woman next to me actually had tears in her eyes after the second song. All of the choirs were amazing. The Young Men's Ensemble blew me away. If you live in this area and get a chance to attend the spring concert or the big finale concert, do. They are that good. 10. Laundry, meals, childcare. Everyone wanted to wear clothing and eat food this weekend, and the youngest gent wouldn't change his own diapers or make sure he stayed away from sharp things and high places. Go figure. Lovely lady, thirteen, zestfully zipped through Lives of Extraordinary Women: Rulers, Rebels (And What the Neighbors Thought) written by Kathleen Krull and illustrated by Kathryn Hewitt. Lives of Extraordinary Women offers nutshell biographies of twenty politically powerful women from different historical periods and cultures. Each 2-3 page bio is accompanied by a well-done humorous caricature and followed by a short "Ever After" section containing 2-3 additional facts about the woman and her legacies. Lovely lady's favorite: Elizabeth I. She said, "She was outrageous!" Lives of the Artists: Masterpieces, Messes (And What the Neighbors Thought), also written by Krull and illustrated by Hewitt, was another library find about three weeks ago. I didn't assign this book, but I did have to hunt for it so that we could return it on library day. I skimmed through this one a bit too, one artist at a time. I thoroughly enjoyed reading about each artist, and Hewitt's caricatures are fun to look at. Initially I was a bit disappointed that there weren't pictures of actual works of each artist included with each bio, but about halfway through the book (which was as far as I got before we had to return the book, since it disappeared into the lovely lady's room) I came to the conclusion that I preferred the focus on the artist's life. The bios in both books are interesting and short, offering a quick overview of each person's life rather than in-depth information. Perfect for an introduction to, for example, the subject of women in history. And a great way to spark further exploration. Lovely lady is chomping at the bit to get to Elizabeth I's reign in our history studies. I ended up tracking down the works of an artist I found particularly interesting. (Mary Cassat, right about the time I made this post.) Lovely lady has requested that we look for Lives of the Writers: Comedies, Tragedies (and What the Neighbors Thought) the next time we go to the libary. I'd like to see if our branch library offers the rest of the series as well: Lives of the Musicians, Lives of the Presidents, and Lives of the Athletes. 1. Be kind to one another. It's that simple. 3. Oh, for heaven's sake. Just say "Excuse me," and move on. Everyone gets gas from time to time. You'd think the novelty would have worn off by now, but noooooooooooooooooo. Really, it's not as funny (or, alternately, as embarrassing) as you think. 4. No hitting. This includes kicking, pinching, poking, biting, pushing, bumping, and any other kind of physical contact with the intent to harm or bother. 5. You may not say "But I was just...." I saw you. I already know what you're doing. I'm not blind, nor am I confused. I saw it the first time, which is why I told you to stop. There is no explanation that will make it ok that you are chasing the cat, sticking out your tongue at your sister, or showing your chewed food to your brother. I am also not inclined to believe that the true intent of that fist heading rapidly toward your brother's head was just a friendly pat on his hair. 6. Bleah. Stop picking your nose. 7. Close it, pick it up, turn it off, put it away. I am your mother, not your maid. 8. Just don't. I cannot possibly think of every little thing that your impish little imaginations can conceive. So, whatever it is, just don't. 9. Treat the other people in the family the way you'd like to be treated. Be kind. Be honest. Be fair. Be patient. Be respectful. 10. Love each other. You don't have to like one another every moment of the day. But find and nurture the love in your hearts for each other. Cristy's Tuesday Ten House Rules. My baby girl isn't a baby any more. Last night, she came to me while I was getting her brothers ready for bed and said, "Mom, I need to talk to you." "Go right ahead, my dear. What's up?" I replied. "Um, I think maybe we should go in the other room. I need some help." "Oh. Okay. Just one minute." It dawned on me what she needed help with. And why she'd been so impossible all week. I've been hoping to put this day off for a few more months, but it's been obvious for a while that she's growing up. She whispered to me in a low voice, so discreet. She was confident and matter-of-fact and not the least bit embarrassed. Why am I writing this? It's pretty personal, after all. I'm writing about it because I'm her momma and I cry a little when I see her growing up. Because for moms of girls this is as much a rite of passage for us as moms as it is for our daughters. Because when the young me went through this I was too mortified to breathe a word to my mother, and my lovely young lady's cool confidence wows me and humbles me at the same time. And because since the day she was diagnosed with autism I have dreaded this day. I never know what to expect from this lovely quirky unpredictable young lady, and she's knocked me off-balance again. Honestly, my picture of this day involved shrieking and lots of tears. It helps that she has an older sister who is open and matter-of-fact. It helps that I have always tried to be open and matter-of-fact. It helps that her sister passed on the book I bought a couple years ago. But still, I can't find words for how....normal an experience this was. Normal can be hard to come by around here. She knew without being told that it was not a topic for public discussion. She knew how to ask for help. She was a little bit excited to be growing up. In a way it's a rite of passage for me as well, to see my first baby beginning to leave her girlhood behind. I'm excited to see her growing up. I get to grow up a little more too, right along with my daughter. She still plays with dolls and watches cartoons, and snuggles on my lap. And with this lovely daughter the idea of growing up and moving out into the world is a bit more complicated because she'll likely always have a need for a mix of dependence and independence. But she's not my baby any more, the little girl that she was is growing away. She's facing her future, one more step closer to the young woman she'll be. She has struggled so much and come so far. I am proud of her. I can't wait to see what she's going to do next. Lovely lady, thirteen. I thought this might be a good book for her to read an age where she's starting to decide who she is in this world and where her interests lie. No, I lie. She came to me and said "I finished my reading book," and Bird by Bird was on top of the stack sitting on the bookshelf at my eye level. Serendipitous, yes? She's a writer, working on her third (fourth?) novel. "Oooooooo!" she said when I handed her Bird by Bird: Some Instructions on Writing and Life by Anne Lamott. I noticed today that her bookmark is nearly to the end. I can't wait to hear what wisdom my lovely young writer has gleaned from this book. Got some time to kill? Check out these sites: Powells.com interview with Anne Lamott, and a PBS film, bird by bird with annie, including some audio clips of Lamott on her life. Lovely young sister is reading Ballet Shoes by Noel Streatfeild. She seems to be plowing her way through the novel with her usual "you're making me read something different" enthusiasm. 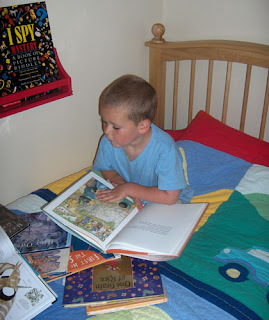 Reading comprehension is a struggle for our autistic sweetie, so she prefers to stick with tried-and-true favorites that she understands. She'd rather read Betsy-Tacy series for the umpteenth time. By now, I think that she could probably recite the darn things, and I say that only half tongue-in-cheek: When she was four she could recite almost the entire dialogue of Disney's animated 101 Dalmatians. She does seem to be following the story in Ballet Shoes fairly easily, and she says she thinks it's good. Here's her review of Ballet Shoes, since she just brought me some tea and stayed to keep me company: "It's good. I like it. I like the girls. I like stories about girls." I'm running out of girly series ideas for this lovely lady that aren't complete and utter twaddle. Any thoughts? A Christmas season bedtime favorite. I read Auntie Claus (by Elise Primavera) to the gents this evening. It's the story of Sophie and her mysterious and beloved Auntie Claus who disappears ever year after Halloween and doesn't return until Valentine's Day. Sophie decides to solve the mystery one year, and discovers the true meaning of Auntie Claus' first rule of Christmas. The illustrations are darling, cute without (usually) tipping over into "cutesy." Auntie Claus has an official website here. There's even a BB&G (Bad Boys and Girls) quiz. Our read-aloud this month, Stories and Poems for Extremely Intelligent Children of All Ages, selected by Harold Bloom. The ladies and gents ask me to keep reading, just one more page or one more poem. Some favorite stories so far: The Bottle Imp (Robert Louis Stevenson), The King of the Golden River (John Ruskin), and Reflections (Lafcadio Hearn). If you're not in the habit of poetry as a read-aloud selection, this book offers a nice introduction. Poems between the stories makes for a nice read-aloud flow, allowing us to clear a story from our heads before moving on to the next short story. The poetry selection is varied and the poems are lovely and fun to read. For novice poetry readers (me) and listeners (the ladies & gents) it's been a wonderful experience. We laughed at Carroll's "Beautiful Soup" and promised that we'll all memorize it together and make up a tune so that we can sing it on soup nights. We'll be taking a short break from Stories and Poems so that I can read The Best Christmas Pageant Ever, written by Barbara Robinson. Maybe this will be the year that I don't cry at the end. Ha! I'm in the middle of The Thirteenth Tale (Diane Setterfield). It's kept me up a few "just-one-more-chapter" nights. Ghosts, twins, a crumbling mansion, madness, books. Perfect entertainment. My favorite thing about this book, though, is the cover. Isn't it gorgeous?